The 2GB, 32GB version of the Xiaomi Redmi Note 4 priced at Rs. 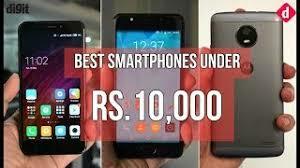 9,999 in and currently is the best budget smartphone under Rs. 10,000 in India. In terms of performance, the Snapdragon 625 powered phone performs better than almost all devices around the same price. It has one of the most reliable battery life we have seen on a sub-10k smartphone. Xiaomi has also improved the camera in the new phone, making it an even better proposition. Overall, It offers the best performance and battery life of all smartphones below Rs. 10,000 that are currently available in India. However, limited stocks are still a big hurdle to pass through. The Xiaomi Redmi 4 takes up the mantle from the Redmi 3S Prime. The phone is now available with a fingerprint scanner across all its variants. Available in both 2GB, 16GB and 3GB, 32GB variants under Rs. 10,000 makes it one of the best budget options. You can also opt for the 4GB, 64GB variant of the phone, but you might have to extend your budget for that. Moreover, the phone has the best camera in the sub-10K segment. If you are looking for the best looking phone under 10000, then you should get the Canvas Infinity from Micromax. Micromax has managed to offer an LG Q6 like display in an more affordable form factor and offering better overall performance. In the addition both the front and rear cameras on the phone are one of the best we have seen in the category. The Yu Yureka is another good option in the sub-10K smartphone category, offering pretty much the same performance as the Xiaomi Redmi 4, but in a newer, more good looking design. The Phone is available in two kinds of black colours and looks quite premium in both of them. It features 4GB of RAM and 32GB storage, setting a new benchmark in its price segment. The battery life is also decent, but the camera quality is quite inconsistent. The Lenovo K6 Power is another good option in the sub-10 budget. This K-series phone from Lenovo challenges the famed Xiaomi Redmi 3S prime. In fact, the K6 Power turned out to be as good a phone as the Redmi 3S prime in terms of performance. In addition, the 5-inch phone packs a 1080p display, and the 13MP rear camera on the phone is also better than that of the Redmi 3S prime. Moreover, if you want to buy a smartphone under 10000 and don’t want to wait for a flash sale, this might be your best option. If you like a stock like Android UI on your phone, the Moto G4 Play is your best option to buy in a budget. The Snapdragon 410 SoC powered device may not be as powerful as the Redmi 3S, but it will not disappoint if your day to day usage does not include gaming. Further, it has decent battery life and is one of the most ergonomic smartphones available. The smaller cousin of the Coolpad Note 5, is one of the best looking phones in the budget segment, but besides that it has a decent display and battery life. That being said, the Coolpad Note 5 Lite is hard to recommend over the Redmi 4 or even the Redmi Note 4 which are available around the same price. The Moto G4 is the last year budget offering from Motorola, which currently is available for around Rs. 10,000. This 5.5-inch smartphone may not be as good a performer as other phones which come above it, but it is still a decent performer. The phone offers a decent build quality and a reliable battery life as well. The rear 13MP camera is also quite good. Above is a list of the best phones under 10000 in India with companies offering the best specification.